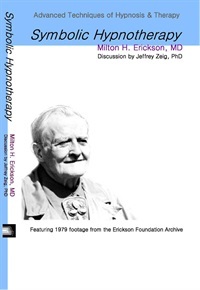 A hypnotherapy session conducted by Milton H. Erickson, MD in 1978. 2.5 APA Continuing Education Credits available for an additional $10. Just add the stream to your cart and a pop-up window will ask if you want to add the CE credit. "Additional Participant CE" is to allow a secondary person to get credit for this video with you. This training tool contains segments of hypnotherapy conducted by Erickson, with the same subject, on two consecutive days in 1978. Erickson demonstrates how symbols may be used as metaphoric forms of communication to foster new ideas and understandings. Zeig discusses Erickson’s technique. Dr. Zeig introduces original 1964 footage and reveals Dr. Erickson's patterns with understandings gleaned from discussion with Dr. Erickson himself. 2 APA Continuing Education Credits available for an additional $10. Just add the stream to your cart and a pop-up window will ask if you want to add the CE credit. "Additional Participant CE" is to allow a secondary person to get credit for this video with you. Dr. Zeig introduces original 1964 footage and reveals Dr. Erickson's patterns with understandings gleaned from discussion with Dr. Erickson himself. Dr. Zeig introduces original 1978 footage and reveals Dr. Erickson's patterns with understandings gleaned from discussion with Dr. Erickson himself. German dub. Dr. Zeig introduces original 1978 footage and reveals Dr. Erickson's patterns with understandings gleaned from discussion with Dr. Erickson himself. 2.5 APA Continuing Education Credits available for an additional $10. Just add the stream to your cart and a pop-up window will ask if you want to add the CE credit. "Additional Participant CE" is to allow a secondary person to get credit for this video with you. 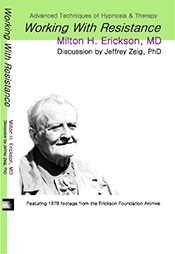 Dr. Zeig introduces original 1978 footage and reveals Dr. Erickson's patterns with understandings gleaned from discussion with Dr. Erickson himself. Dr. Zeig introduces original 1979 footage and reveals Dr. Erickson's patterns with understandings cleaned from discussion with Dr. Erickson himself. German dub. Dr. Zeig introduces original 1979 footage and reveals Dr. Erickson's patterns with understandings cleaned from discussion with Dr. Erickson himself. 2 APA Continuing Education Credits available for an additional $10. Just add the stream to your cart and a pop-up window will ask if you want to add the CE credit. "Additional Participant CE" is to allow a secondary person to get credit for this video with you. Dr. Zeig introduces original 1979 footage and reveals Dr. Erickson's patterns with understandings cleaned from discussion with Dr. Erickson himself.